Printed from http://www.bodytalksystem.com//learn/news/article.cfm?id=1077 on Apr 20, 2019. Aha! Now We're Getting Somewhere! "The imagery that comes to me to describe this feeling is that of my psyche as a train that has been picked up off its tracks and plomped down onto a clearer track where it has better traction and no unnecessary stops." From Miami to Colorado to California, we are happy to report that John is blazing yet another trail in BodyTalk history. Did you know that it is almost a quarter of a century since John taught his first BodyTalk class? If you count the number of BodyTalk modalities, it is hard to fathom anyone evolving a therapy of such scope and eclecticism in such a short time. If you are ever around John when he is in the process of evolving a new class, it is not uncommon to hear him utter a delighted "Aha!!! Now we're getting somewhere!" whenever he comes upon the next "key." His enthusiasm and passion for the work just seem to grow. What might be less known about John is that he evolved most of the BodyTalk modalities while on tour; between classes, countries, cities and in hotel rooms. Home was always just a stop-off on the way to the next class, the next lecture, the next tour. This is what is so different about BodyTalk Direct; how and where it came about. In the past year, for the first time since BodyTalk began, John decided to stay home and, after many, many years on the road, put down roots. This meant he could get a dog, Maverick, who accompanies him everywhere; is meeting people in his community, and is just thoroughly enjoying the simple pleasures and rituals of daily life lived in one place. As you can imagine, his creative process is benefiting exponentially. And, voilà, BodyTalk Direct. Not surprisingly, of all the many BodyTalk courses John has evolved so far, this one has a very different feel to it. In 1963, meteorologist Edward N. Lorenz made a presentation to the New York Academy of Sciences and was literally laughed out of the room. His theory was called the Butterfly Effect. What Lorenz had discovered in his laboratory was a most evocative notion, one that the smallest event can have large, widespread consequences. The name of Lorenz's theory stems from his proposal that a massive tornado in one part of the world might well have its roots in the faraway flapping of a tiny butterfly's wings. It took almost 30 years and multiple great minds to finally prove his theory correct, valid and that it worked every time. Nowadays, not only do we associate Lorenz's discovery with weather patterns, but retrospectively, we have come to recognize that one small action, however insignificant seeming at the time, can change the course of a human life. And more than that. We have come to realize that one small action happening here can have a global rippling effect, touching the lives of people we have never even met, in faraway countries we have never even visited. When it comes to John's latest course, the analogy of the butterfly and the tornado seems most fitting. Not just because BodyTalk Direct involves the concept of torsion fields and John actually teaches about the healing nature of tornadoes. The Butterfly Effect is also most applicable to BodyTalk Direct because the gentlest, simplest of techniques sets in motion a profound ripple effect throughout the system and beyond. All of us familiar with BodyTalk know that the simplest Access techniques create a ripple effect throughout the system and magic can happen. But something quite extraordinary seems to be at work in John's new work, something very different. As the name implies, BodyTalk Direct seems to communicate even more directly, deep within the psyche. It is as if its first and greatest priority is to stir up the old order of things in a way that feels simply right. 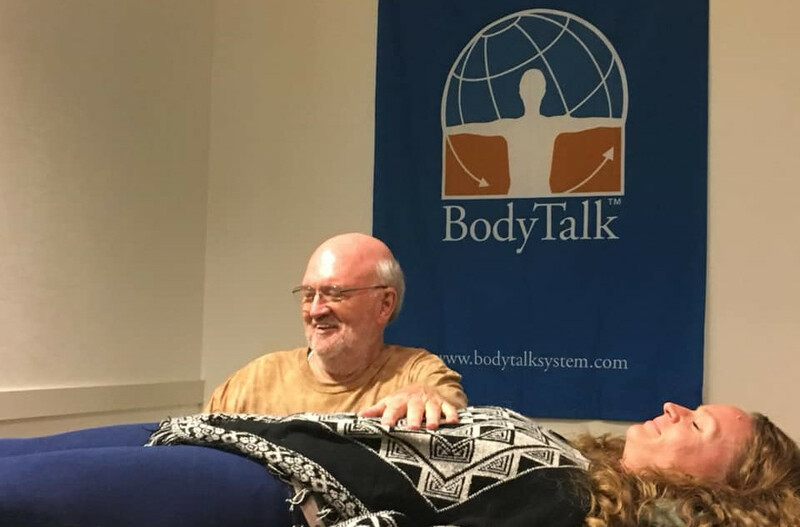 In the photo above, John treats Elzabieta Kosmicki in the BodyTalk Direct class in Denver. Even though we are a global community, sometimes reaching out and making a real difference beyond our own little corner of the world can seem so difficult. It is helpful to remember that each small action, even the tiniest tap, has a ripple effect. "With all things and in all things, we are relatives." "My experience this past weekend at the BodyTalk Direct seminar in Denver, Colorado was phenomenal. What a change I felt in my own system from the information and treatments that Dr. Veltheim shared with us. There was real clarity and a calmness inside I have not felt for awhile. Makes daily life go so much better." – Ronald L. Greenawalt D.C., F.A.C.O. "BodyTalk Direct represents a paradigm shift that could be metaphorically described as replacing a two-wire phone line with a fiber optic cable. And yet it's simple to learn and apply to sessions right away – you don't need lots of modules to upgrade your practice. Rising after a demonstration session, I felt a strong shift – as if I had "jumped tracks" to an almost parallel life path that feels easier and clearer. BodyTalk Direct has the potential to take the penultimate BodyTalk "Aha" moments to more powerful and yet subtle levels, and to upgrade our body's communication hardware/software as well. I highly recommend BodyTalk Direct!"